Some 50,000 people visit Buckingham Palace each year. This includes heads of state, diplomats, people receiving honors as well as people invited to dinners and receptions. It also includes approximately 30,000 people who are invited to one of the Garden Parties held in Buckingham Palace's 40 acre garden during the summer. But you do not have to win an election, do a significant service to the British nation or even receive an invitation to go inside the Palace. 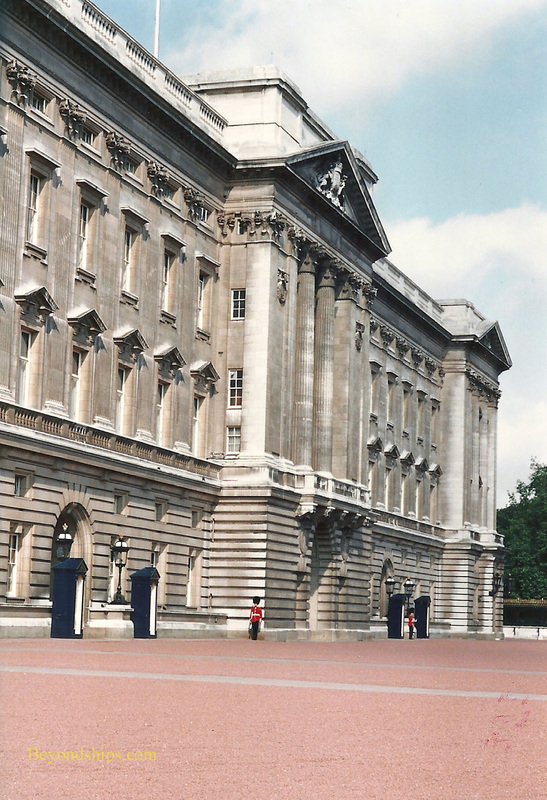 Buckingham Palace was opened to the general public in 1993. The original objective was to raise money for the restoration of the public rooms that were damaged during the 1992 fire at Windsor Castle. However, visiting the Palace proved so popular that the Palace has been open to view every year since. The Palace is open each year in August and September. During this period, the Queen is not usually in residence as it encompasses the time she traditionally stays at Balmoral Castle. When the Palace is open, the public only has access to the State Rooms although there is a tour that includes highlights of the Palace's 40 acre garden. There is also a garden cafe. The State Rooms are the rooms used for receptions, ceremonies and meetings with political figures and heads of state. Although the rooms are done in a variety of styles, there is a grandeur to all. Entry to the State Rooms has been traditionally via the Grand Staircase. Designed by Nash to replace the original stairs at Buckingham House, the stairs rise up to a landing and then split in three directions. The room is done in white with gold accents and red carpeting. On the walls are huge portraits of kings and consorts by Beechy and Lawrence. Sculptures huddle in niches. Greek pillars and pilasters sour upwards towards a glass dome. The combination of the natural light from the dome and the predominantly white walls prevents the feeling from becoming too heavy. Contrary to the image portrayed in the fairy tales, the monarch does not spend much time sitting on her throne. The Throne Room is only used on special state occasions such as when the Queen receives a formal address. It has, however, also been used for royal wedding photos. The Throne Room was begun by Nash but was completed by Edward Bore. At one end, is a canopied dais with thrones embroidered with the Queen's and Prince Phillip's initials respectively. This is a very tall room with a massive chandelier. The walls are covered in red silk, framed with white paneling and gilded accents. A highlight of the State Rooms is the Picture Gallery. The largest room in the house, this room is used to display art work from the royal collection. Because the Queen lends out works to museums, the contents of the Picture Gallery are always changing. But due to the depth of the royal collection, the contents can always be counted on to be masterpieces. In addition to displaying art, the Picture Gallery is used for receptions and occasionally for dinners in support of charities that members of the Royal Family patronize. Another highlight is the opulent State Dining Room. Designed by Edward Blore, this room has more of a Victorian feel. Richly done in red, it has a series of portraits on one wall and windows looking out to the garden on the other. Each room is impressive. Not only in architecture but in the contents, which include some of the greatest treasures from the royal collection. After all this is the monarch's official residence. The State Rooms also have the vigor of a living environment. This is not a museum or recreation. Rather, the Palace's primary function remains to carry out the business of the monarch and the nation. As such, the State Rooms are used by people, not just viewed by visitors. For information on visiting the State Rooms at Buckingham Palace, see the Royal Collection Trust's website.